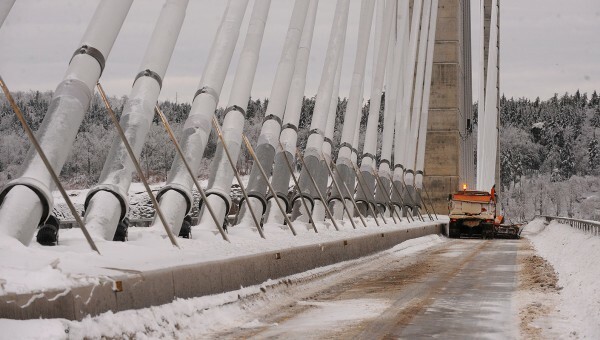 A snowplow clears the Penobscot Narrows Bridge deck of snow and ice debris Monday. VERONA ISLAND, Maine — In nine years, Charlie Bickford never had been late for work. The 60-year-old Belfast resident has been the host of the Woodstock Nation Radio show at WERU, the community radio station that’s based in Orland, he said on Monday. But as a result of an ice storm last week and the subsequent closure of the Penobscot Narrows Bridge on Sunday and into Monday, he missed all of one of his noon shows and more than half of another. As a result, Bickford had to drive to Bangor and then back down through Orrington to get to the station in Orland, turning his regularly 35-minute commute into an hour-and-45-minute drive. 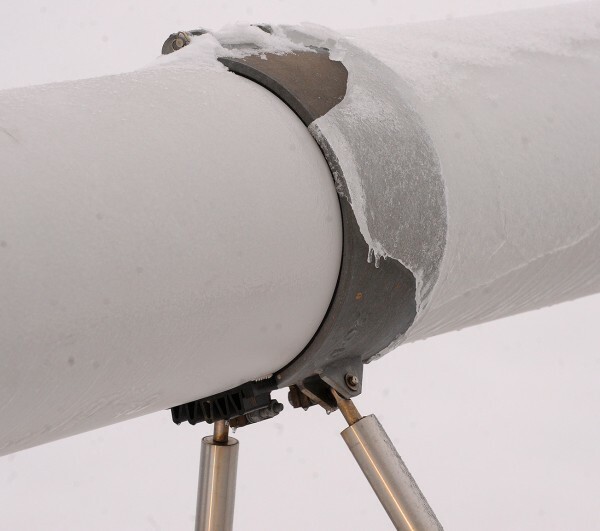 The Penobscot Narrows Bridge was closed on Sunday morning because, as temperatures rose, ice that had been stuck to the cables of the bridge from the recent storm began to melt and fall off onto the roadway. The closest alternate route to cross the Penobscot River is 20 miles away in Bangor, adding 40 miles to some motorists’ commute. 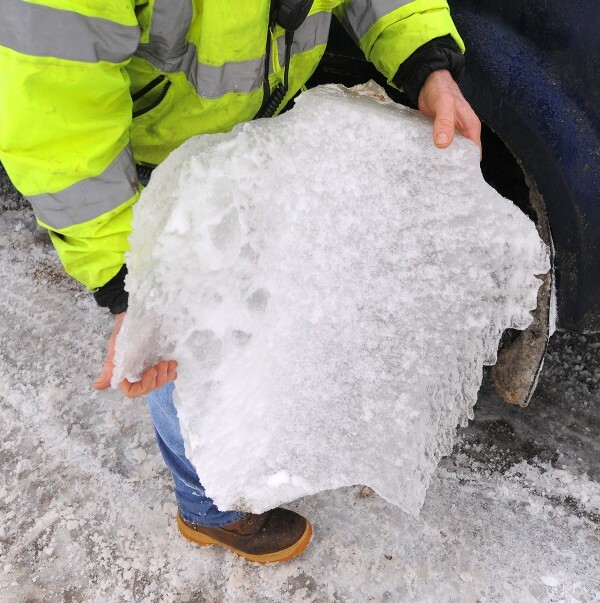 At least four cars reportedly were damaged by falling chunks of ice, though no one was injured. A Ford SUV was listed as a total loss with damage to the roof, hood, windshield and rear window, according to a prepared statement from Hancock County Sheriff’s Office officials. 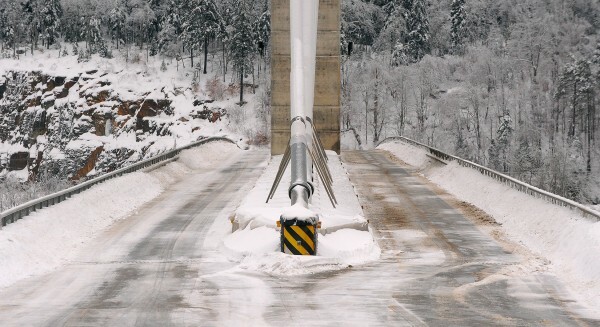 Maine Department of Transportation press secretary Ted Talbot said a crane would arrive at the bridge around 5 p.m. Monday to attempt to knock ice off the cables. Just before 4 p.m. Monday, MDOT officials still were unsure when the bridge would reopen, but if the use of the crane is effective, they hope to open the bridge in time for Tuesday morning commuters. “We continue to consult with industry experts from the public and private sector,” Talbot said. He added that they are speaking with experts who handle bridges in other locations, including Boston, the location of the Leonard P. Zakim Bunker Hill Memorial Bridge. 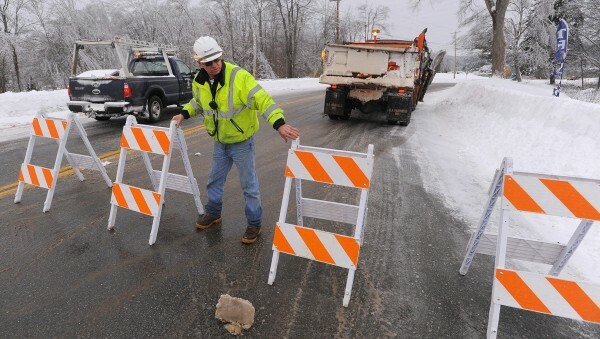 That was not the case on Sunday, when car-sized pieces of ice fell onto the roadway, according to those present. The Penobscot Narrows Bridge carries Route 1 traffic from Verona Island to Prospect. Construction on the bridge began in 2004 after an inspection of the Waldo-Hancock Bridge, which originally carried Route 1 across the Penobscot River, revealed that the cables on the bridge were significantly deteriorating and that some cable strands were broken. Correction: An earlier version of the story reported that the Penobscot Narrows Bridge carries Route 1 from Verona Island to Penobscot. It is Verona Island to Prospect.